I'm not sure why I decided to share this, except I was in the mood to post something, and this was kind of fun to see. My random story: I almost never buy name brand food. Let's face it: milk is milk. Sugar is sugar. The brand has very little to depend on the quality. But every once in a while, the name brand is on a crazy good sale, so it's cheaper. A couple of weeks ago, our Walmart had all the Kraft Cheese on for a CRAZY good price. So that's what I got. And they had their low fat cheese for the same price. I'd never tried it, but I grabbed it. I got 3 bricks of 2% milk cheddar. It tastes just the same! I love it - great taste, less guilt! Too bad it's usually so much more! Tonight for dinner I was craving some homey goodness. So I made "Cheesey Noodles" (aka homemade Mac n cheese. My kids HATED homemade mac n cheese until I changed the name. Now they can't get enough of it!) I worried that my low fat cheese might not work as well. But it mixed in ok. Then we sat down and dished it. YOU CAN NOT IMAGINE THE GOOEY STRINGS!!! Really, I've never even seen pizza this cheesy before. It was awesome! I actually used less cheese than normal too. I even tried to take a picture. This is after it had cooled a bit - there were double that many when we started! Yum. Just looking at this makes me want to have another plate. Here's my family's version of mac n cheese, just in case you were wondering. I never actually measure anything in it anymore. But I think it's pretty accurate. I've been told it's easier than some people's versions - but you tell me. Cook noodles according to package directions. Drain. Melt margarine over medium low heat. Stir in cornstarch. Gradually add milk, stirring constantly. Bring to an almost boil while still stirring constantly so it doesn’t scorch. Add cheese. Stir in cooked noodles and salt. Savor every delectable bite! 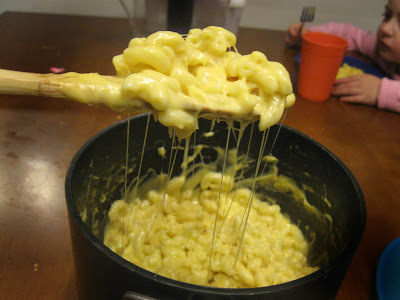 Homemade mac and cheese is one of my favorite comfort foods. I CANNOT eat it without bingeing!!! Thankfully, my family won't eat it, so I never make it!